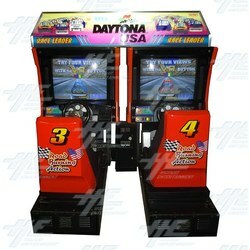 Home - Arcade Machine News Stories - 12 Daytona USA Twin Driving Arcade Machines Now Available! Daytona USA One is a high-speed stock car racing game that allows you to choose from four dynamic viewpoints on the fly to get a true racing perspective. The realistic stock car control allows drifting, controlled braking, four-wheel drifts, and skillful acceleration to keep the lead. At the time of its release, Daytona USA was considered one of the most detailed 3D racing games ever created due to the virtual word being fully texture-mapped, coupled with a constant full 60fps refresh rate – even with multiple onscreen opponents. 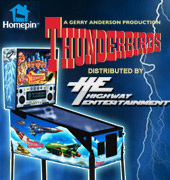 The original arcade release is a twin machine, and was the first game to allow up to eight players to race simultaneously against each other. The player is put behind the wheel of a stock car (known as the Hornet), with the choice of three tracks: the Three-Seven (777) Speedway (Beginner) includes 8 laps, 39 cars and features Sonic the Hedgehog's face engraved into a cliff face; Dinosaur Canyon (Advanced) includes 4 lap, 20 cars and requires players to make use of driving techniques such as drifting; and Sea-Side Street Galaxy (Expert) includes 2 laps and 30 cars to really heat up the competition. The player's objectives are to outrun the competing cars, and complete the race before time runs out. The A.I. in the game for this is quite smart for the time of its release: if a player makes a good time on their first lap, the opposing cars will drive in the way of the player to make the race more challenging for them; on the other hand, if the player makes a bad time on their first lap the opposing cars will actually move out of the way of the player's car. Daytona USA Two was released by Sega in 1998 as a follow-up to the extremely successful Daytona USA. In this game players get the opportunity to race some of the best known stock cars around the track at unlimited speeds. Stick the pedal to the metal while zooming through banks and turns. Feel the effects of collisions into walls with the all-new Crash Impact Generator which delivers shocks to the player's back and soles of their feet upon impact, including the feel of the engine's rumble. Daytona USA Two has superior graphics to the original, utilizing the Sega Model 3 hardware. A notable change from the original is the ability to select a car and corresponding driver, each with varying capabilities for varying levels of player experience. These cars include a Chevrolet Monte Carlo, Pontiac Grand Prix, Ford Thunderbird and a Nissan Skyline GT-R.
Just like before, the Daytona 2 USA has three courses – a Beginner course with 8 laps, an Advanced course with 4 laps, and a long Expert course with 2 laps; The 'time lap' mode also returns in this version. Mirrored versions of the tracks can be played as well (another feature carried from the original Daytona) by holding down the Start button when selecting the course. The cabinet features two simulator seats (twin), two 29" monitors, and is able to link up to four players (two units) for tournament modes or just for some extra competition. Daytona 2 USA twin driving arcade machine will be a smash hit in any location. Please refer below for some of our Daytona Machines on offer, for more information and to discuss what other Daytona Arcade Machines are available, please email or call 02 4968 9313.